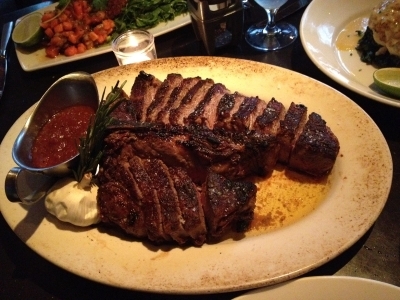 "The only time to eat diet food is while you're waiting for the steak to cook." - Julia Child "
This juicy Tuscan style steak is smothered in roasted garlic with a touch of rosemary on top. Enjoy! Mangia Italiano! Very proud to announce my new paperback "Eat Like an Italian" will be released around mid June. This book will contain most of our old favorites plus many new recipes. Official release will be announced through our newsletterm "Shut Up and Mangia", and our Facebook page. Again thank you for your support. Without you we would not exist. If you haven’t joined us yet please visit my Facebook Fan page. Besides our rss feed, all new recipes and site announcements will appear on this page. We have over 6000 fans so far and it keeps getting bigger everyday. Thanks. We’d appreciate it if you share this page with all your FB friends. 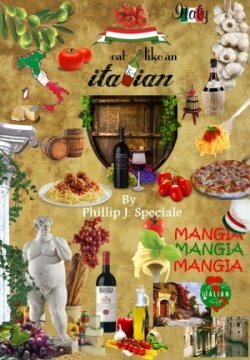 Great Chicago Italian Recipes is dedicated to adding new and traditional Italian recipes for your enjoyment. The site is getting bigger and better. Don't forget the addition of “The Italian Grocer“ and the“The Great Italian Music Store“ for your convenience. Thank You for supporting this site. If you enjoy our newsletter please feel free to email this newsletter to a friend so they can Subscribe to "Shut Up and Mangia!" and begin to enjoy the many Italian recipes we have to offer.